Every morning, before heading to work, you make a sandwich for lunch using perfectly square bread. But you hate the crust. You hate the crust so much that you’ll only eat the portion of the sandwich that is closer to its center than to its edges so that you don’t run the risk of accidentally biting down on that charred, stiff perimeter. How much of the sandwich will you eat? Extra credit: What if the bread were another shape — triangular, hexagonal, octagonal, etc.? What’s the most efficient bread shape for a crust-hater like you? The shaded area can be split up into two distinct areas. 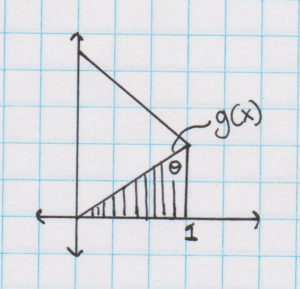 The area under g(x) from 0 to the intersection of g(x)/f(x) (which we’ll call c). And the area under f(x) from c to 0.5.
g(x) is defined by that angle theta, which in the case of a square shape evaluates to: g(x) = x. 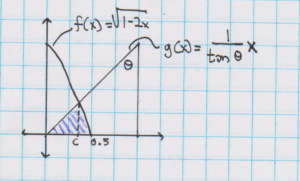 We set g(x) = f(x), and solving for x will provide c. So we need to solve x in:r cotangent(θ)*x = sqrt(1-2x). 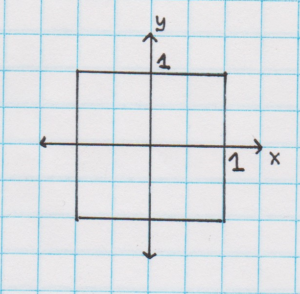 That yields x = c = 21/2 – 1. To solve for the area underneath our curve we evaluate: [Integral g(x) from 0 to c] + [ [Integral f(x) from c to 0.5]. Since g(x) is a triangle with a base and height of c and g(c) respectively , the [Integral g(x) from 0 to c] term is 0.5*c2*cotangent(θ). We’ve simplified our equation now to: [0.5*c2*cotangent(θ)] + [ [Integral f(x) from c to 0,5]. 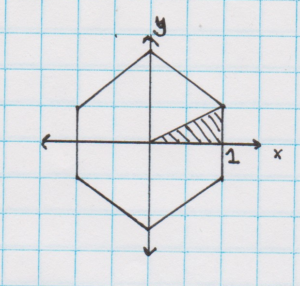 Using c = 21/2 – 1 we solve and get the area of the shaded region to be: 0.1094. The base and height of the triangle in the first quadrant (shaded region in the 2nd picture) is 1 and g(1) respectively. 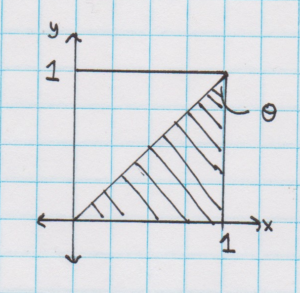 So the area of that triangle computes to 1*g(1)*0.5 = 0.5. So the proportion of the sandwich eaten is: 0.1094/0.5 = .2190. The answer to this week’s Riddler is “You will eat 21.9% of the sandwich”. So now for the extra credit, we look at other shapes. Let’s take for example a hexagon, as shown in the graph below. Just as before we’re only concerned with the first quadrant, specifically the shaded triangle in the first quadrant. Divide the result of Step 7 by Step 8 to find the proportion of sandwich eaten by the picky eater. 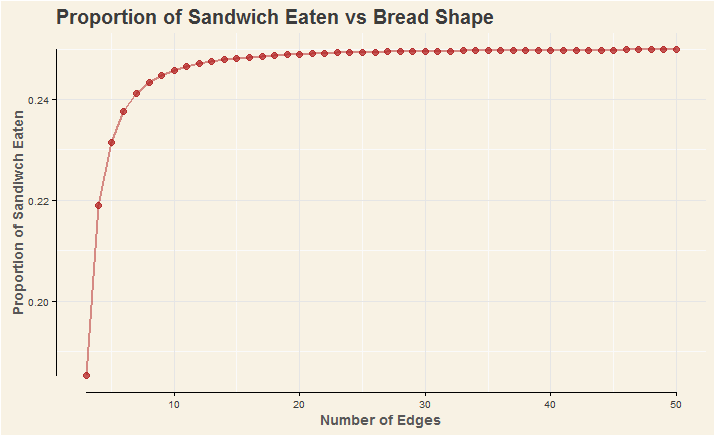 We can see as the number of edges (n) gets larger, the proportion of sandwich eaten approaches 0.25. A polygon with infinite edges is a circle. For a circle with radius r, the area that is equidistant to the center as it is to the edge is defined by the concentric circle with radius r/2. In that case the proportion eaten is: [(r/2)2*π]/[r2*π] which simplifies to 0.25. In the context of the graph this makes sense. We conclude that the most efficient shape is a circle, with 25% of the sandwich being eaten. Previous PostPrevious The Riddler – Will You (Yes, You) Decide The Election?